I read these words on a plaque, embedded in the sidewalk, shortly after arriving in Manhattan last week. 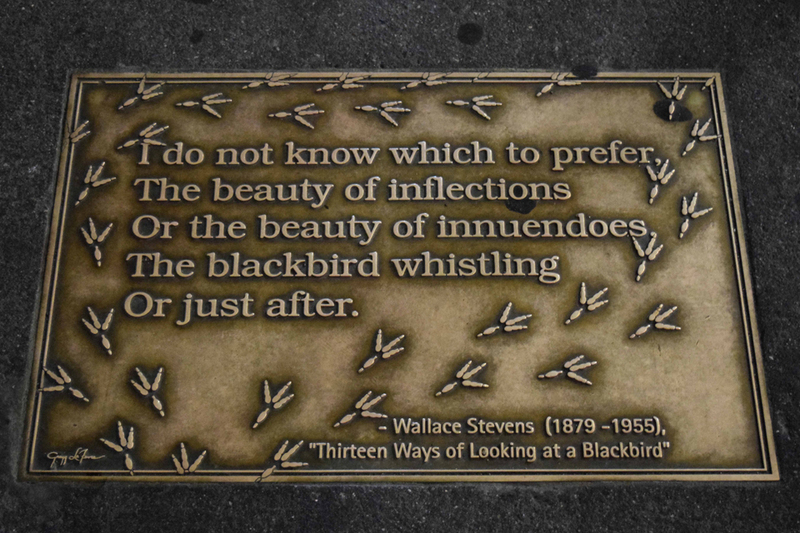 The plaque is one of several lining the way to the New York Public Library on 5th Avenue, but it was this quote, from Wallace Stevens’ poem Thirteen Ways of Looking at a Blackbird, that spoke to me. I had tickets to see Blackbird on Broadway, starring Jeff Daniels and Michelle Williams, and knew it would be one of the trip’s highlights. So seeing the plaque felt like a fitting welcome to the city. What I didn’t know then, reading those words, was that the trip would be bookended by a second highlight. There was another Broadway show I’d really wanted to see—The Crucible, featuring an extraordinary cast that includes Saoirse Ronan, Ben Whishaw, Sophie Okonedo and Ciarán Hinds. Tickets were pretty pricey, so GC and I initially passed on that play. But while wandering through Central Park, we decided, on a whim, to see if we could get rush tickets. What we got was so much better than I imagined. We were offered an incredible discount on prime seats: centre orchestra, just a few rows back from the stage, and right beside Sean Penn. It may seem like a silly thing to mention here, but being next to one of the greatest living actors, and someone whose work and films I greatly admire, couldn’t help but amplify the experience of watching such a high caliber cast performing in such an incredible production. To me, one of the very best things about New York is that it provides a stage for the highest concentration of the world’s most exceptional artists. In Manhattan, on any given day, you have access to performances you just wouldn’t see anywhere else. And this isn’t only on Broadway. While wandering through lower town, we saw a poster for an upcoming talk at a community centre; the speaker was David Mamet. When I lived in New York several years ago, I joined some friends at the last minute for a panel and Q&A at the Irish Arts Center with Gabriel Byrne, Helen Mirren, Tim Robbins and Susan Sarandon. There’s always something going on and I find it exhilarating. So as we waited for the curtain to rise in the Walter Kerr Theatre, sitting next to Sean Penn, who is easily one of my favourite actors, the point came across loud and clear: Magic happens in NYC and we happened to be catching an act that evening. Regardless of your seatmate, The Crucible is an experience worth having. It’s directed by Ivo van Hove, the theatre legend who delivered a highly praised production of Arthur Miller’s A View From the Bridge on Broadway late last year. Set during the Salem witch trials of the late 1600s, The Crucible was written in the 1950s as a parable about McCarthyism, but it continues to be eerily prophetic, especially in the face of today’s escalating xenophobia and religious discrimination. John Proctor (Whishaw), the well-meaning husband of Elizabeth Proctor (Okonedo), tests the limits of the old “hell hath no fury” adage when he tries to move past his indiscretion with young Abigail Williams (Ronan). The Proctors former servant, Abigail also dabbles in witchcraft. When the townsfolk suspect her and her friends of ill doing after a few mysterious deaths and some late-night incantations in the woods—in the buff—they turn around to point their fingers at others, including the Proctors. From there, things quickly spiral down the rabbit hole. The Crucible’s set is spare yet detailed, and dimly lit—glowing candles here, a fiery stovetop there. Among other pieces, it features an ever-present chalkboard in the background, where characters occasionally write commandments or proclamations as the audience is schooled in the dark arts of humanity: judgment, fear, dishonesty, blame. The play’s music, by celebrated stage and screen composer Philip Glass (The Hours, Fantastic Four), feels almost ambient. It pulses throughout much of the production, sometimes with strings, others with percussion, mostly subdued but nearly always present. The Crucible’s biggest success comes in the form of its large and highly skilled cast, delivering fine performances all around. It was a privilege to see Ronan (Atonement, The Lovely Bones), a gifted film actor, perform live. It was even more breathtaking to watch Whishaw (The Danish Girl, Q from Skyfall and Spectre) and especially Okonedo (Hotel Rwanda) onstage. They deliver commanding, riveting performances that literally left me shaking after the curtain call. As good as The Crucible is, Blackbird’s tune is the one that still echoes through my thoughts. From the moment the play opens, we know right away that Blackbird is a story about people laid to waste. When the set, a drab meeting room in a bleak office, spins around on a turntable, finally turning to face to us, we see that it’s littered with garbage. The waste bin is overflowing, the table carelessly scattered with leftovers and other remnants. The place is filled with the ruins of exchanges and conversations past; it was abandoned and no one took the time to clean things up. Into this room, Ray (Daniels)—or Peter, as he’s now known—forcibly marches Una (Williams). Tension is everywhere, beating through their bodies, blasting forth with every word, and it doesn’t let up for the next 90 minutes. Through Una’s broken words and Ray’s defensive bluster, we soon learn that the pair was sexually involved 15 years ago, when he was 40 and she was only 12. They haven’t seen each other since the fateful night that separated them, when Una was stranded in a suite and Ray was charged for his crime. Neither has recovered from their three-month affair, though both have tried (and been tried). After serving his sentence, Ray changed his name, found a new job and partner. Una, in desperate bids for both escape and control, pursued a long line of sexual partners, angrily shocking her parents with the details; based on her steady sniffle and erratic body language, she also chased down a few other lines. I saw Blackbird from a very different vantage point than I did The Crucible. I was perched at the front of the Belasco Theatre’s third-level balcony, looking almost straight down at the stage. It made for a slightly dizzying experience that added to the play’s feeling of unease. Watching Una and Ray, two lost souls crippled by love, anger, shame and betrayal, frantically trying to wrench themselves free of the pain, is an intense experience. Although there’s no denying how wrong their involvement was, Ray and Una did love each other; perhaps they still do. But in the aftermath, the only way they found to move forward was in darkness. Ray’s life, as Peter, is a lie. And Una. Una lived through public and private humiliation. Painted as both a temptress (with “suspiciously adult yearnings”) and a victim, she was repeatedly told that the love she thought Ray had for her was driven only by the sick desires of a dangerous and calculating predator. For nearly two decades, she was left to relive Ray’s final words to her, their final moments together, over and over, like a sleepless child lying in bed after the lights have gone out, with no one to talk to, no one to comfort her. Nothing there but memory and imaginings, both so easily distorted. Daniels delivers a strong, solid performance. But Williams blew me away. She has been wonderful so many times before (Blue Valentine, Take This Waltz). As Una, she transforms herself. Her body is electric, her movements frenetic. I didn’t recognize her voice; at times, she practically growls rather than speaks. I wish I could see Blackbird again, from another perspective, to get another glimpse—a closer view, but also just a different view, to see how the actors play the story out on another night, how they might change the key for the often lyrical dialogue they deliver. The Crucible is currently in previews; it opens March 31, 2016 and runs until July 17. Blackbird runs until June 11. I hope you have the opportunity to see both. Amazing! What an experience – thanks for sharing! Thanks, Laura! It was pretty special. There’s SO much to see in New York – and I’m only touching on the plays. What a place.